Our deepest sympathies go out to the family, friends and coworkers of Douglas County police officer Zack Parrish, who was killed in the line of duty this morning. The others injured in this senseless tragedy are also in our thoughts and prayers. 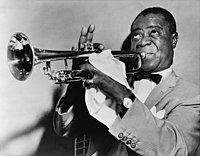 Louis Armstrong (1901–1971) is considered one of the pivotal musicians in jazz for his contributions as a trumpet player, composer and singer. Brooke studied them as they climbed onstage to assemble and test their instruments and was somewhat surprised to discover that they looked less like a rock band and more like a group of twentysomethings who’d all been best friends at their elite New England boarding school. The drummer, Wes, had the requisite long hair, only his didn’t hang in greasy strings around his face. Wes’s mahogany locks were thick and wavy and lush, hair only a girl really deserved. He wore a sporty green polo shirt with clean, pressed jeans and a pair of classic gray New Balance sneakers. He looked like the kind of guy who’d caddied during the summers in high school—not to earn money, but to ‘build character’—and then didn’t work again until it was time to join his father’s law firm. The head guitarist was the oldest of the crew, probably in his early thirties, and although not quite as preppy as Wes, his beat-up old chinos, black Converse sneakers, and JUST DO IT! were hardly rebellious. Unlike his drummer colleague, Nate didn’t fit any of the leader guitarist stereotypes—he was chunky and had a shy smile and downcast eyes. Brooke remembered how shocked Julian had been to hear Nate at the audition after sizing him up when he first walked onstage. ‘This guy walks on stage and immediately you know he’s the kid who got the [expletive] kicked out of him his whole life. He’s, like, afraid of his own shadow. And then he starts to play and man, he just rips it. It was out of this world.’ Their trio was rounded out by Zack, the bassist, who looked more like a musician than his counterparts but whose cool spiky hair and wallet chain and subtle swipe of eyeliner actually made him seem more poseurish.